We invite you to explore India - the Land with infinite beauty ! Whether you soar high into Himalayas or peer under the ruins of the Ancient monuments dotting the landscape of India, you will cherish the experience long after your visit ! This India Travel Guide on Mahabodhi Temple Bodhgaya is free from any commercial interest! This site is dedicated to promote India - the vast subcontinent, its glorious past, magnificent landscape and its infinite variety. 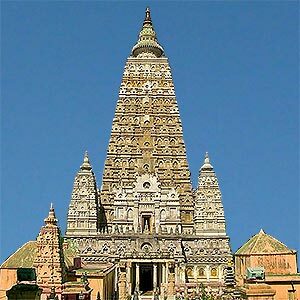 The 'Great Awakening Temple' as it is literally known, the Mahabodhi Temple in Bodh Gaya is the place where Siddhartha Gautama, the Buddha attained enlightenment. It is also known as Mahabodhi Mahavira or The Great Stupa. The Mahabodhi Temple is a Buddhist stupa and is frequented by Buddhists from across the world. The holy Bodhi tree is located at the western side of the temple. Bodh Gaya is located 96 km from Patna, Bihar. Emperor Asoka set up the Vajrasana to represent the seat of enlightenment during the 3rd century B.C. He also built a stupa in worship of Lord Buddha. The Mahabodhi Mahavihara Temple has undergone numerous renovations and restorations over the years. The Mahabodhi Temple is one of the earliest Buddhist temples to be built in brick. The Mahabodhi Mahavihara has now been declared a World Heritage Site by the UNESCO. Bodh Gaya is considered a sacred place of Buddhist pilgrimage in the world. Buddhists believe that this stupa is the navel of the universe. The Buddha in the main sanctum sanctorum is a gold painted statue; built by the Pala kings of Bengal. The colossal image of Buddha is seen seated touching the earth with his right hand also known as the Bhumisparsa mudra. It was in this posture that the Buddha achieved the supreme enlightenment. The courtyard of the temple is studded with many smaller stupas and Buddha statues, a few of which are several hundred years old. This temple complex houses seven other places of importance; the places where the Buddha meditated after the attainment of enlightenment. This brickwork structure is among the finest examples of later architectural styles and dates back to the Gupta period. With a central tower at 180 ft and smaller towers around it, the Mahabodhi temple has sculpted stone balustrades and memorial column. The tower is surrounded by surmounted by amalaka and kalasha. The railings surrounding the temple are either built of sandstone or unpolished granite. You can find images of Goddess Lakshmi and Surya. Other images have lotus flowers and stupas. The statue of Buddha inside the Mahabodhi temple is made of black stone covered in bright orange robes. The sacred Bodhi tree: Siddhartha Gautama meditated under this sacred Bodhi tree and attained enlightenment on the day of Vaisakh Purnima (month of May). Buddha spent the first week in meditation under this tree after attaining enlightenment. The Bodhi tree is a Papilla tree (Indian fig tree). The present tree is the fifth descendant of the original tree; the original tree being destroyed several times by natural calamities and man. Vajrasana: The polished soapstone throne built by Emperor Asoka, it is popular as the seat of Buddha's enlightenment. Animesha Lochana Chaitya: Lord Buddha spent his second week of meditation at this spot. He meditated in a standing posture while gazing at the Bodhi tree. Cankamana: Lord Buddha spent his third week of meditation here, practicing walking meditation. This place is also known as cloister walk. Ratanaghara: Lord Buddha spent his fourth week of meditation at this spot. As he meditated, it is said that a ray of six colors emanated from his body. The Buddhist flags are based on these colors. Ajapala Nigrodha Tree: Lord Buddha spent his fifth week of meditation at this spot. He also delivered a discourse here. Muchalinda sarovar: Lord Buddha spent the sixth week of his meditation at this spot. A severe thunderstorm broke out and Lord Buddha got drenched. Seeing this, the snake king of the Lake called Muchalinda protected the Buddha from the rains and winds with his hood. Rajayatna Tree: As Lord Buddha sat here under meditation, two merchants from Burma took refuge with him. They became his first followers. Apart from the above, Mahabodhi temple has a meditation park, a bookshop, library and an oil lamp house/and joss stick house. The nearest railway station is Gaya. Express trains take about 2 hours from Patna, 15 hours from Delhi and about 8 hours from Kolkata. Gaya has an airport; which has flights from Kolkata, Patna, Delhi, Mumbai and Bangkok. You can find accommodation in guesthouses and monastery guest houses. You can consider staying at the Buddha Vihara run by Tibetan Lamas - just a few minutes from the Mahabodhi temple complex. The Buddhist University of Nalanda is located nearby. Take the opportunity to visit the Niranjana River. You can visit the temple between September and January. Summers are very hot in Gaya but Buddha Jayanti is celebrated in May on a full moon. Chanting and meditation is held for an hour in the morning and again in the evening. The Buddha Mahotsav is a cultural and religious festival. You can visit the archaeological museum that houses relics, scriptures and ancient statues of the Buddha. At around 75 kms from Gaya is Rajgir where Buddha taught his disciples. You can also visit Gridhakuta or Vulture Peak - the meditating spot of the Buddha.